The Japan Foundation will be conducting a project called "Sound Migration" which is a contemporary music collaboration between Japan and Turkey. Four musicians and an actress will be working together in Istanbul, Turkey, in September, to create new pieces, and then in the beginning of October will be performing them in Izmir, Cairo, and Budapest as well as Istanbul. The performance in Istanbul will be held as the opening in the 'Istanbul International Contemporary Dance & Performance Festival (iDANS)'. Furthermore, the performances in Istanbul and Izmir will be a part of the 'Japan Year 2010 in Turkey'. Coming together from the two countries will be: Kazuki Kunihiro, a Japanese composer; Saadet Türköz, a Kazakh Turkish vocalist; Jun Kawasaki, a Japanese contrabassist; Şevket Akinci, a Turkish improvisational guitarist; and Micari, a Japanese actress. These five persons, all soloists in their own right, provide an extremely intense sound as well physical movement and they use this intensity to construct a world that is something quite unique, which is the reason for their being selected. Türköz's keen individuality, a blend of Central Asian narrative tradition and jazz improvisation, cannot be without influence from the fact that her parents had fled East Turkistan as refugees and made their way to Turkey over the course of more than ten years. Kawasaki and Akinci, utilizing the high level improvisation techniques, will explore the connection between 'self' and 'other', which will not likely be something reducible in meaning to national differences. Micari, through her unique expressiveness, which rouses the imagination of the audience, will undoubtedly liberate the body movement from its subordination to the music. The creative process of these five individuals from completely differing backgrounds is expected to produce a harmony as well as a deliberately persisting sense of heterogeneity. 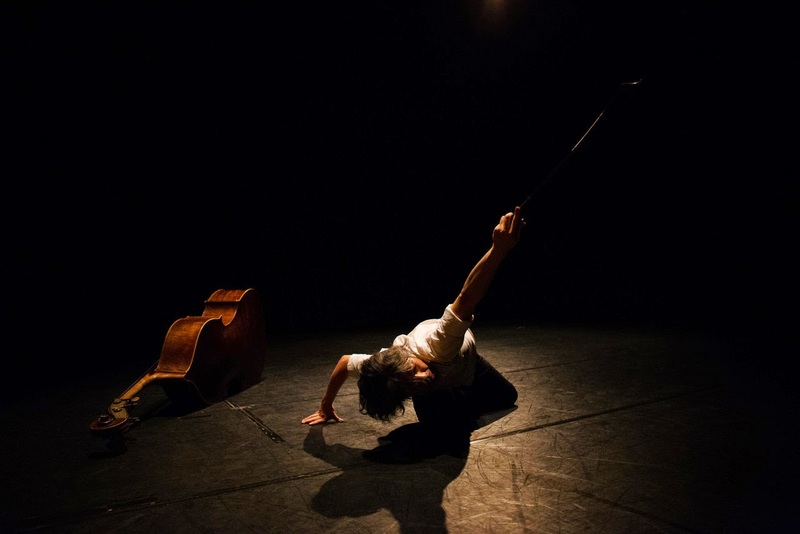 Standing at the center of this subtle balance and giving it a sense of wholeness is Kunihiro who displays a sure-footed compositional ability in his international theatrical collaborations. It is this harmony together with the diversity of elements that generates the power to create a new music and makes this project something to believe in. The pieces will be developed for three weeks in Istanbul. The whole work will be comprised of eight musical scenes. The five performers together with these scenes will be allowed to freely 'migrate' through the joint creative process, recurring in altered forms and, in due course, bringing forth an evocative world of sound. It will be an original act of creation that cuts off a slice of 'now,' the present moment, where the migration of peoples is occurring on a global scale. Composer, vocalist, guitarist, leader of mixture band (Data) and punk band (Aujord'hui il fait beau), he is, on the other hand, quite involved with music for the stage such as theatre, dance, etc., as well as traditional Japanese music. He moves easily between a variety of musical styles with a free and supple musicality. Lyrics that bring images leaping before the eyes, a high-level performance technique, and a presence on stage that exudes a sense of his own personal being, make him a highly regarded musical performance artist of exceptional talent. He displays a unfailing compositional ability in his music for the stage and has drawn much attention through works such as: the collaboration between four countries, Performing Women: 3 Reinterpretations from Greek Tragedy (2007), the grand Kabuki, Sakura Giminden (2010) directed by the contemporary theatre director, Kazuyoshi Kushida, and others. Improvisational vocalist. Born of Kazak parents who fled Eastern Turkistan (Uyghur autonomous region) as political refugees and made their way to Istanbul, as a child, Türköz learned the traditional, rich narrative styles of Central Asia in the Kazak community in Istanbul where she lived, which, along with the echoes of the free versification of the Koran which she heard sung daily, formed the basis of her later style. When she was 20 years old she moved to Zurich, Switzerland, and there encountered free jazz and experimental music, which she applied layer by layer to her own musical roots eventually arriving at her present style. She is presently based in Zurich and involved in solo activities working with musicians from many countries including: Elliot Sharp (guitar/sax, US), Fred Frith (multi-instrumentalist, US), Nils Wogram (trombone, Germany), Koch-Schuetz-Studer Trio (Switzerland),?Satoshi Kakeishi (drum, Japan/US), etc. Samples of Türköz's music can be heard at her home page: http://www.saadet.ch/index-flash.html. In addition to being a contrabassist and composer, Kawasaki has been successful in performing his own solo pieces, and is also a member of the bands, Data and Aujord'hui il fait beau, both led by Kunihiro, as well as the improvisation ensemble, EXIAS-J and others. As a member of EXIAS-J, he has toured in such places as Russia, Lithuania, and the United States. Furthermore, he has participated in the Japan Foundation's contemporary-traditional Japanese music program (Russia, Ukraine, etc). He has actively undertaken collaborations with a variety of genres such as dance, theatre, poetry readings to name a few, as well as works for the stage such as Yodaka no Hoshi (Streetwalking Star) (conceived and choreographed by Senrei Nishikawa, traditional Japanese dancer) (Poland performance) and Camille Claudel (Paris, etc.). He embraces a strong interest in language and since 2006, has been conducting a seminar series entitled 'Pathways of Poetry'. A number of his performances can be seen on YouTube. An improvisational guitarist, Akinci is participating in diverse projects varying from jazz to noise music. After graduating from Berklee College of Music, US, he issued a number of albums on his own, and also recorded with other musicians. He joined and established various music groups, among which is the leading-edge improvisational group, "Islak Köpek (wet dog)." Musicians he has worked with include Lê Quan Ninh (percussion, Fr), Eugene Chadbourne (guitar/banjo, US), Sussan Deyhim (vocal, Iran/US), Luc Ex (bass, Holland), and many others. He has also been involved in radio since 2006, hosting a radio program on free jazz and free improvisation. In addition, he also composes for films, dance, and theater, and is a published poet. Samples of his music can be heard at his home page: http://sevketakinci.com/. An actress and performer, after a successful stage debut in Bartok's Bluebeard, written and directed by the late Shuji Terayama, she participated in the formation of the Kuna'uka Theatre Company (http://www.kunauka.or.jp/) in 1990 with the director, Satoshi Miyagi. The company became known for its unique style, in which two actors, one performing the actions and the other speaking the words, portray one character, as well as the establishment of its unique aesthetic of using a space that could be transformed from one scene to another. Micari played the leading roles in Medea, Tenshu Monogatari (The Castle Tower), The Mahabharata, Othello, Tristan und Isolde and others, traveling with them to many cities of the world. She is known for her extremely concentrated and intense performing style and has gained much acclaim in the Japanese theatrical scene. Some of her guest appearances include Electra and Madame de Sade, directed by Tadashi Suzuki.